Wanna learn about somebody super cool? 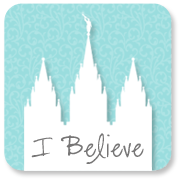 It's LDS, best-selling, YA/MG author Obert Skye. He's a totally nice guy and an awesome writer who currently lives in Idaho with his wife and children. And what is his real name? Every body is curious, but Obert is what he signs his books with, so that's good enough for me (people do speculate that he is the author Robert Farrell Smith --"Obert" is "Robert" without the "R". And some even think he might be Brandon Mull --which is totally untrue because I know them both --and they're both great-- but anyway, just call him Obert. It's magical). 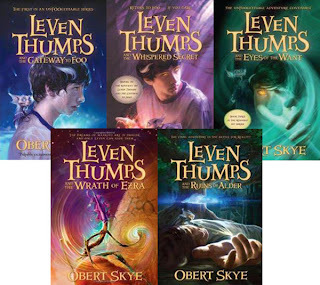 Obert's first series was Leven Thumps (5 books) which now has a new sequel trilogy called Beyond Foo (book 1, Geth and the Return of the Lithens came out May 9th of this year). There is also a side book to Foo called Professor Winsnicker’s Book of Proper Etiquette for Well-Mannered Sycophants. --And how fliptastic is this?! The Leven Thumps movie rights were bought a few years ago by Celtic Rose Entertainment! See the little sliver of a picture on the left? That's from their site. It's Clover, a character from the series (Geth is also in the green poster up above). Check out the CRE site and Leven movie info here. 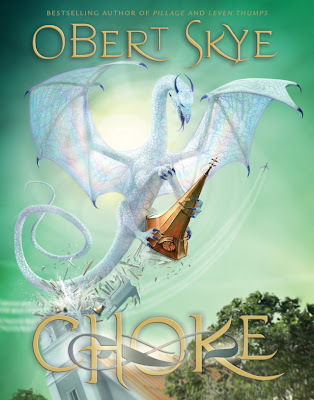 Aside from the Foo books, Obert's other works include the Pillage trilogy of which Pillage and Choke are out now, with the final book, Ambush, coming out in February of next year. Obert has been touring for his most recent book Wonkenstein: The Creature From My Closet (Willy Wonka + Frankenstein, say whaaat? ), first in a TWELVE book series, featuring illustrations by Obert himself! Cool, huh? 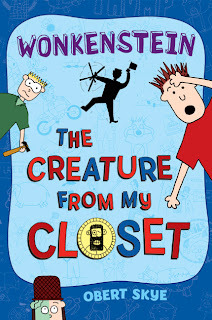 The series is along the lines of Diary of a Wimpy Kid --except with creatures (see trailer below). Obert even has a short story in the anthology Swashbuckling Fantasy: 10 Thrilling Tales of Magical Adventure. 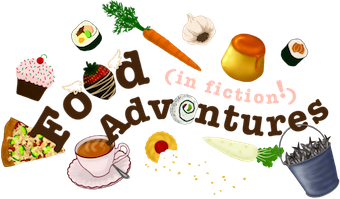 And in the near future, get ready for a new awesomesauce (gosh, I love that word), intense fantasy, five book series titled Deepest Dark. I've been able to meet Obert Skye in person twice so far. 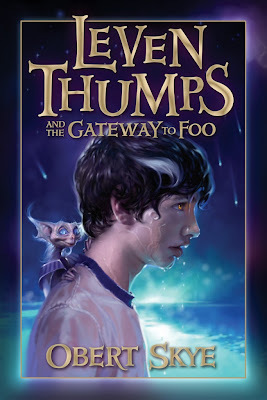 the first time was at the Utah Festival of Books on BYU campus back in June where I got Leven Thumps and the gateway to Foo (book 1) signed. The second time was a recent, sneak attack book signing by Obert at the Orem Barnes & Noble in conjunction with the Dixon Middle School book fair. 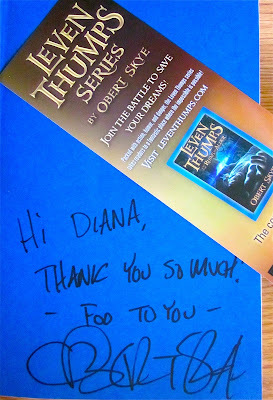 I took books 2-4 of the Leven Thumps series to get signed, as well as a couple of posters, bookmarks, and Pillage samplers. We had a great conversation at his signing table while the Dixon youth belted out some cool tunes a few book shelves away. Seriously. He's a really down-to-earth, nice guy. I wish I could have talked with him longer! 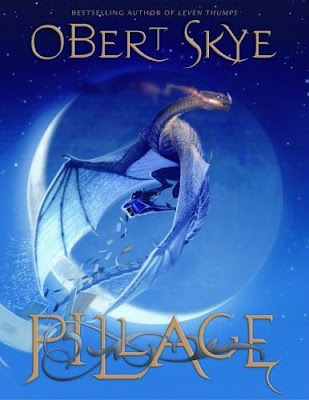 Here's the Official Obert Skye Website. The Official Leven Thumps Website. And the Leven Thumps Wiki. 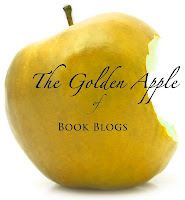 Here's a Q & A with Obert from Simon & Schuster. 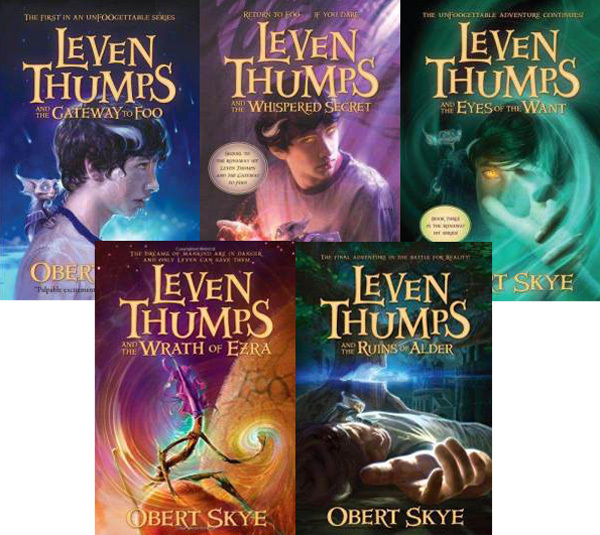 Leven Thumps is one of my favorite series I have ever read! 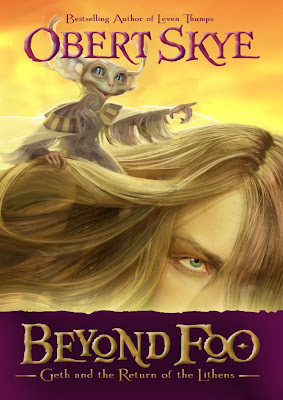 (So is Fablehaven by Brandon Mull). I can't wait to get to his other 2 series.